It’s strange to think of iMovie—the first app in the series that later became iLife—as an underdog, but Apple’s video editing application has found itself trying to overcome the initial poor impressions of iMovie ’08 by longtime iMovie users. iMovie ’11, introduced at Apple’s Back to the Mac media event, adds long-awaited features like improved audio editing and 1080p HD output, and takes advantage of the program’s editing strengths to introduce One-Step effects such as instant replays. iMovie ’11 also includes surprises, large and small. The main draw is the ability to quickly cut together movie trailers, but just as exciting are features for identifying when people appear in clips, correcting for rolling shutter side effects, and the return of a traditional timeline using the new Single Row view. After far too long, it's now possible to adjust audio levels within a clip. Was someone in the shot standing close to the microphone? View the clip's audio waveform (which appears below the video clip), and drag to select the portion that's too loud. Then, drag the audio level (the Volume bar) down; iMovie automatically applies a fade to the section ends to avoid abrupt volume changes—and all without requiring that you set audio keyframes. Speaking of fades, you may never again need to access the Fade In and Fade Out sliders in the Audio inspector. When you position the mouse pointer over a clip’s audio waveform, fade handles can be dragged left or right to adjust the fade. To be honest, just those audio features would be enough to satisfy some people, but Apple went further, adding an equalizer, a slider for reducing background noise, and 20 audio effects that can simulate the acoustics of small or large rooms (including a Cathedral effect), change pitch, and apply effects like Telephone or Robot. As with video effects, however, you can apply only one audio effect per clip. It’s now possible to edit volume levels within a clip. To quickly put together a fun highlight reel of your footage, create a new Movie Trailer project and choose a template. 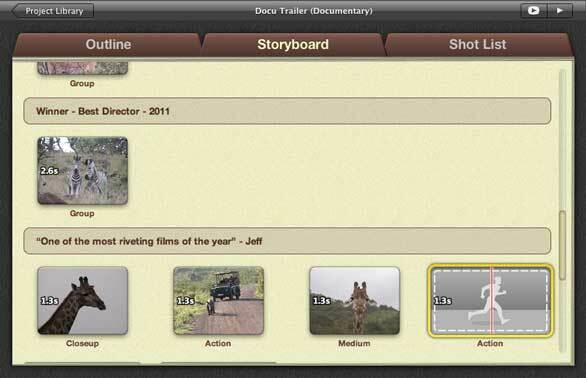 iMovie provides the title styles and background music (composed for iMovie, with some scores performed by the London Symphony Orchestra), and a host of placeholder animatics. Select bits of your footage that match the animatic styles—such as closeup, group, or action—and iMovie builds the rest for you. The Movie Trailer feature provides animatics for shots that need your footage, and builds a trailer out of them. If your main objection to the new iMovie has been the loss of a traditional timeline, placed at the bottom of the editing interface and scrolling off the left and right edges of the screen, you’ll be happy to know that it’s back in iMovie ’11. Click the Single Row View button, and then swap the Project browser and Event browser (the latter a feature present since iMovie ’08). The new Single Row View—here positioned at the bottom of the window—gives you a real traditional timeline for editing. The new One-Step Effects are shortcuts for making edits that you’d otherwise spend time crafting by hand, like dissolving a sepia clip into full color or including an instant replay. What’s great about the effects is that iMovie really is just automating the process; after applying an effect, you can edit its components. Other common actions, such as speeding up or slowing down a clip, can be accomplished from the Clip menu instead of opening the Clip inspector. iMovie ’09 introduced image stabilization, in which the program analyzed a clip and determined how to adjust the zoom amount and rotation to compensate for camera shake. In iMovie ’11, that analysis now adds a few more features. An important clarification up front: the People Finder feature uses face-detection technology, not face-recognition, to identify and mark footage that contains people. So, it can tell when one or more people are in a scene, and even deduce whether the shot is a closeup or medium shot, but it won’t tell you which clips contain specific people. All the same, it’s a nice addition. iMovie tags footage with keywords to make it easy to find scenes containing people, which makes building movie trailers easier. A related feature is Mark Camera Pans, which assigns keywords such as Pan Right or Pan Left to match the motion of the camera when footage is analyzed. If you shoot video using a camera with a CMOS sensor (like the iPhone or most still cameras), you’ve probably encountered a phenomenon called the “rolling shutter,” which can make active subjects appear wobbly because the image sensor records each frame in passes from top to bottom. Image stabilization can often exaggerate the effect. A preference labeled “Apply rolling shutter correction for clips that have been analyzed” crunches a lot of math to minimize the effect, and an option in the Clip inspector lets you control how much correction to apply. iMovie ’11 adds two more preset themes: News and Sports. What’s interesting about the latter is the easily overlooked Sports Team Editor feature. Perfect for coaches (or just parents) who make highlights of sports event videos, the editor is actually a database of player names, positions, sports, and photos that can be called up to display stats on each person. Enter the data within iMovie, or import a .CSV file from a spreadsheet to populate the database. There are now more options for getting video out of iMovie, including the welcome additions of Vimeo and Facebook (and CNN iReport for newshounds) upload options. And if you spent good money for a camcorder that records 1080p HD footage, you’ll be happy to know that iMovie now provides a 1080p editing path from start to finish. I’ll be looking at these features in more detail in the next few days to see how well they perform for my upcoming review. Jeff Carlson is the author of iMovie '09 & iDVD for Mac OS X: Visual QuickStart Guide (Peachpit Press; 2009) and the managing editor of TidBits.